Here’s a paradox. Even as When Marnie Was There, Studio Ghibli’s Last Feature Film (Probably), plays in British cinemas, a new animated feature bearing Ghibli’s logo opens in the festival circuit. 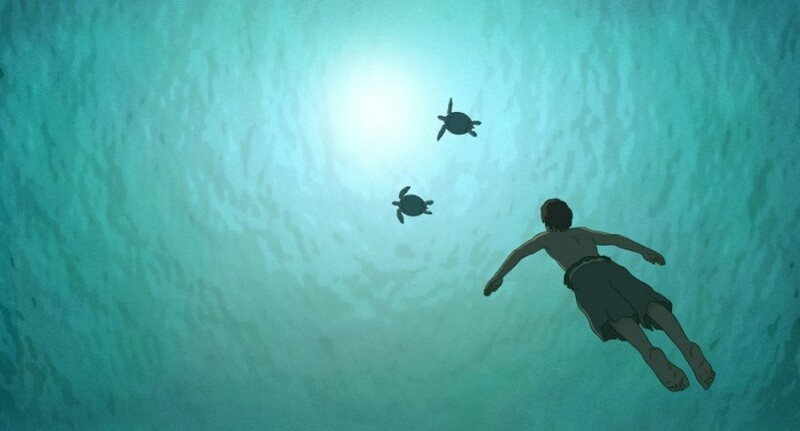 This is The Red Turtle, directed by Michael Dudok de Wit, which debuted at Cannes before playing at another French event, the Annecy International Animation Festival. As we explained in our recent Marnie feature, The Red Turtle is only “tangentially” a Ghibli film. But it’s a good film, and the Ghibli connection is interesting. 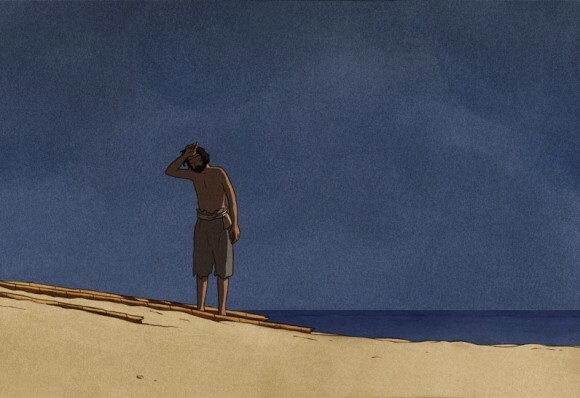 The Red Turtle is a ‘castaway’ story. It’s about an unnamed man washed up on an island inhabited only by wildlife. The film’s early scenes concern his efforts to survive and escape. A mystery develops as the rafts he builds are destroyed by some underwater force. And then… the film develops in several unforeseen ways, although the trailer contains many spoilers – if you just want a sense of how it begins, watch the first thirty seconds. There’s more non-spoiler discussion of the film below, but we should address the Ghibli connection. The Red Turtle wasn’t animated at Ghibli, but at a French studio called Prima Linea (website here), based in the town of Angouleme, which is an animation centre – Belleville Rendez-Vous was made there, and the twenty-first century version of Mysterious Cities of Gold. Before Turtle, Prima Linea had already made animated features, including the adult horror film Fear(s) of the Dark (which has nods to J-horror) and the family adventure Zarafa. Moreoever, The Red Turtle isn’t by a “Ghibli,” or even Japanese, director. It’s by the Dutch-born animator Michael Dudok de Wit, who earned his reputation as an auteur with no help from Ghibli. Before Turtle, he was best known for his short films The Monk and the Fish (1994) and Father and Daughter (2000). The latter won an Oscar; eight minutes long, it’s the impressionistic, wordless story of a woman who forlornly looks to sea all through her life, seeking her lost father. It’s slightly comparable to the plot of Satoshi Kon’s Millennium Actress, released a year later; it may even remind some Japanese viewers of the story of Hachiko. Yet for all the respect he has in the animation community, de Wit went out of his way to stress Ghibli’s involvement when he presented Red Turtle at Annecy. It was Ghibli, he explained, who emailed him back in 2006, declaring, “We want to work with you.” The studio had appreciated Father and Daughter and was interested in the possibility of producing a feature film by him. “It took me months to get over it!” de Wit says of his reaction to the astonishing offer. While the basic story of Turtle is de Wit’s, he discussed it in detail with Ghibli, seeking their thoughts. In de Wit’s words, his relationship with Ghibli was very trusting, without any competitive element. His main contacts seem to have been Isao Takahata, who had befriended de Wit at the 2004 Hiroshima Animation Festival, and Toshio Suzuki. At Annecy, de Wit highlighted his talks with Takahata, whom he described as very sensitive in his love of animation. Not speaking Japanese, de Wit had to communicate through interpreters. However, de Wit didn’t take all the suggestions from Ghibli (who in turn didn’t like all his ideas). Ghibli may have helped him transition from shorts to features, but de Wit’s main story collaborator was a French woman, Pascale Ferran, who’d directed the live-action films Lady Chatterley (based on Lady Chatterley’s Lover) and Bird People. “I don’t see myself as a natural storyteller,” de Wit confessed, though parts of Turtle came to him spontaneously. In particular, the ending “came to him very late” in development. The Red Turtle itself is a fine, absorbing film, though not a game-changer in world animated features, where many recent titles are of very high quality. There are many comparisons one could make between Turtle and Ghibli’s in-house films, but it doesn’t feel like Ghibli. It feels at least as close to – and as unlike – the work of France’s Michel Ocelot (Azur et Asmar, which Ghibli distributes in Japan). 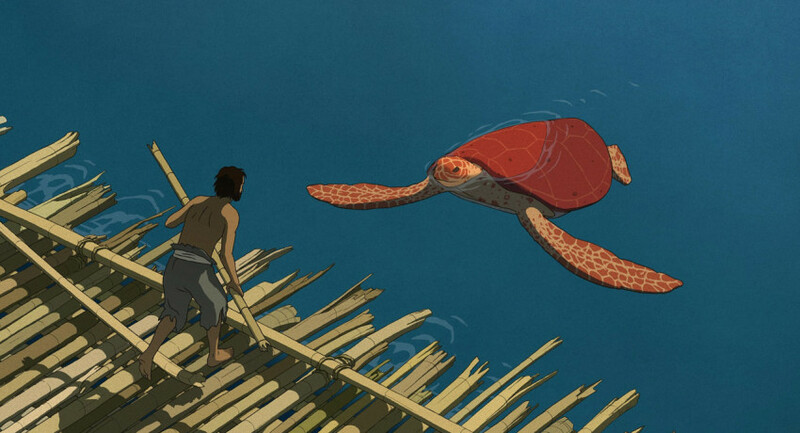 But The Red Turtle is really its own beast, with a tone of peculiarly detached sympathy. Its story is told through mid- and long-shots, with few facial close-ups of its characters (and it’s probably safe to ‘spoil’ that the marooned hero isn’t alone for all the film). Some of the detachment comes from Turtle’s use of archetypes without backstory. The film begins with its hero in the ocean, buffeted by mountainous waves. We never learn the man’s name, nationality, whether he was a sailor or a passenger, or any other personal details about him. He’s swept onto an island – small, but big enough to have woods and marshes skirting a mountain from which the hero can gaze bleakly at the endless sea. The island is neither hostile – the wildlife is restricted to seabirds, crabs and seals – nor benign. Early on, the man slips and falls into a sinkhole, leading to a brief but horribly intense moment when the man has to swim through a tight underwater passage, seconds from drowning. It drew gasps from the Annecy audience. After opening as such a familiar story, there are several unexpected developments in the film, fantastical in the innocent manner of a fairy tale. One could make a comparison with Ghibli’s whimsical Ponyo, but Turtle is more Grimm; it’s suffused with threat and the lurking shadow of death, even when the man’s situation improves considerably. True, there’s a magic event, after which the man gains new companions and soulmates that redefine his life. However, there are still dangers and troubles to come. The magic in Turtle does not let the man transcend the mortal coil; rather, it enables him to reconnect with it. The use of magic unencumbered by explanation is comparable to Ghibli, of course. A more obvious Ghibli-esque touch is that Turtle’s human story is framed against the everyday lives and small deaths in nature. A crab drags away the body of a baby turtle; a fly comes to an end in a spider’s web. There is also a clear link drawn between nature and femininity, as in numerous Miyazaki films. This would once have been considered an empowering ‘feminist’ statement; today, it may be criticised as outmoded essentialism, or worse. There is also some brief imagery of flight in the man’s fleeting dreams. More than once, Turtle reminded me of one of Miyazaki’s more ‘masculine’ works – the pre-Ghibli TV serial Future Boy Conan, not in its tone but in many of its details. Conan and Turtle share prominent images of scuttling crabs – which come to steal much of de Wit’s film – as well as the adventure-story business of building rafts and braving undersea passages. Turtle’s most spectacular sequence is also anticipated in Conan, though Miyazaki played the catastrophic scenario – a natural disaster – for funny thrills. In Turtle, it’s ramped up to a terrifying threat. I was able to ask de Wit if he’d seen any of Conan; he hadn’t. But world animation is rife with such parallels. At Annecy two days after Red Turtle, I saw a new French cartoon called Louise in the Winter, which could be the counterpoint for de Wit’s opus. It’s a comic-melancholy story of an elderly woman who’s stranded in an off-season holiday town, “cast away” amid empty piers and arcades. Red Turtle, like Louise, should be properly seen as a piece of world animation, not a Ghibli film. And yet this may be what the Ghibli brand is now, a recognised mark of quality that can bring ‘art’ animation to popular attention. It is the Ghibli logo, not the names of de Wit or Prima Linea, which is prominent at the start of Turtle; and the same logo which drew loud applause from the Annecy audience. Andrew Osmond is the author of 100 Animated Feature Films. The Red Turtle will be released in UK cinemas on 26th May 2017. I really want this film to do well. I know it’s going to be a good year for animated films since there are already a few really good ones like Zootopia, April and the Extraordinary World, Kung Fu Panda 3, Only Yesterday, Belladonna of Sadness, and now we can include this one.